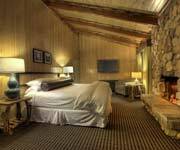 Features: Marriott's Timber Lodge Tahoe A Marriott Vacation Club Resort provides upscale accommodations close to the slopes. 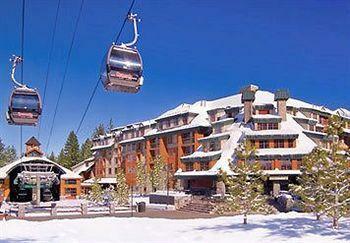 Tahoe Marriott Timber Lodge is located near the Heavenly Gondola and Heavenly Village. 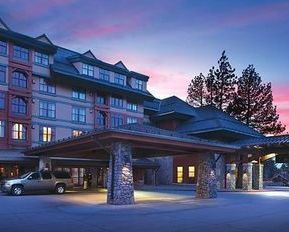 Why We Stay: Marriott's Timber Lodge Tahoe A Marriott Vacation Club Resort provides fine lodging near Heavenly Gondola and Heavenly Village. 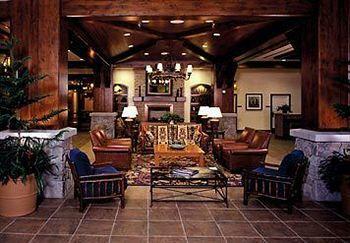 The Amenities: Guests can plan their itineraries at Tahoe Marriott Timber Lodge's concierge desk. 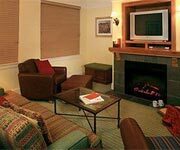 Should guests appreciate a newspaper delivered to their room, the service can be arranged at Marriott Timber Lodge Lake Tahoe. 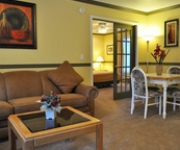 There is daily housekeeping and on-site laundry to keep your belongings clean and tidy. 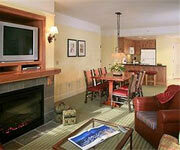 The Ambiance: Marriott Timber Lodge South Lake Tahoe has a welcoming and comforting ambiance. 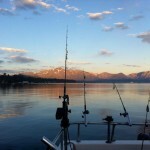 Guests who stay at Marriott's Timber Lodge Tahoe A Marriott Vacation Club Resort feel like they've found their home away from home. 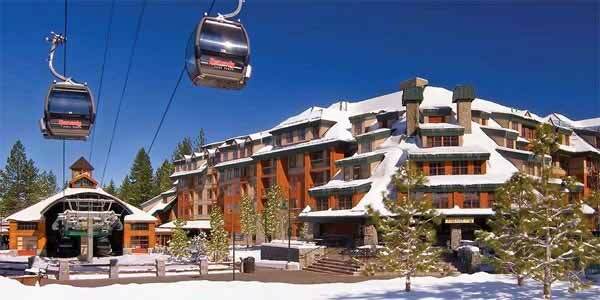 The Area: Marriott's Timber Lodge Tahoe A Marriott Vacation Club Resort allows guests to easily see the sights in the Heavenly Village. 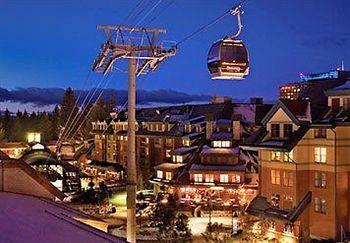 Guests can explore shops and eateries here, as well as get incredible views of Lake Tahoe on scenic gondola rides. 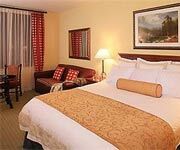 Visitors who are feeling lucky will appreciate that they are within walking distance of the casinos. 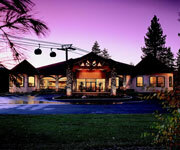 Inside Knowledge: Marriott's Timber Lodge Tahoe A Marriott Vacation Club Resort features an activities center with things that appeal to a wide range of visitors. Sample activities include family movies, board games, creating trinkets and frames, making jewelry, glass painting, teen arcade night, teen Wii hour, and more. 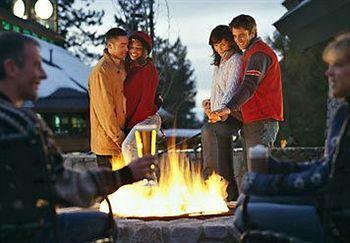 Do Eat At FiRE+iCE: This highly entertaining dining experience at Marriott's Timber Lodge Tahoe A Marriott Vacation Club Resort allows guests to personalize their meals. Guests choose their top ingredients, and can watch their meals being cooked on the Mongolian-style grill. 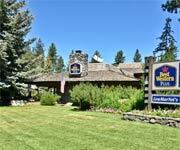 Do Visit The Retreat Center: Marriott Timber Lodge Lake Tahoe's MAZE® Retreat Center at  is a lounge with plenty of entertainment options. There are several huge screens, Wii games, book exchanges, and more. Don't Miss A Workout: Tahoe Marriott Timber Lodge's on-site fitness center ensures that guests can get in their exercise session even while they're traveling. 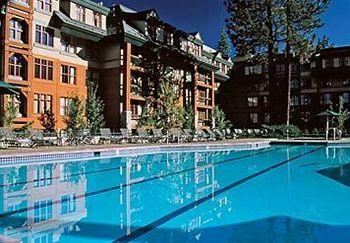 Don't Get Cold: The outdoor swimming pool, whirlpool, and sauna are all heated at Tahoe Marriott Timber Lodge. 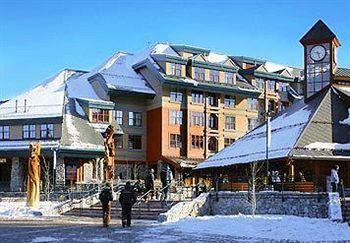 Guests enjoy unwinding at these amenities after a full day on the slopes. 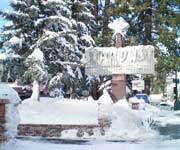 Your magical Lake Tahoe experience begins here. You and yours will enjoy 350 square feet of lovely space. Craving amazing shut-eye? 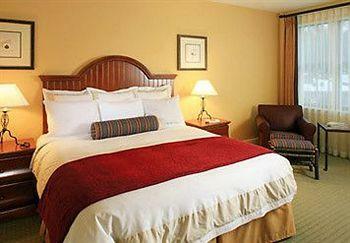 Lay your sweet head down upon the king-size bed and extra comfy sofa bed. The fluffy furnishings will treat you right. Get soapy and clean in the bathroom's shower/tub combination, and style your hair to perfection with the hairdryer. You're in the driver's seat when it comes to how cool and breezy you'd like your room to be. Set the air conditioning to your desired chill level. Do you have all kinds of jewels and valuables on you? When you're not using them, keep the treasures you've brought with you inside the in-room safe. 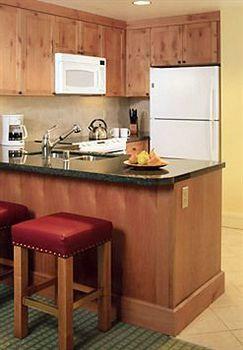 Your family will love the convenience of the kitchenette for preparing food in the room. Make food galore, and then watch premium movie channels on the room's 32" TV. When you want space and lots of it, the villa is the way to go in terms of luxury lodging. Coming in at 835 square feet, this villa accommodates a maximum of four people. Go jump on the bed! Sprawl out on the premium king-size bed and super soft sofa bed. When it's time to get sudsy, the bathroom presents you with the power of choice: you have a separate shower and tub (and the over-sized bathtub has spray jets). 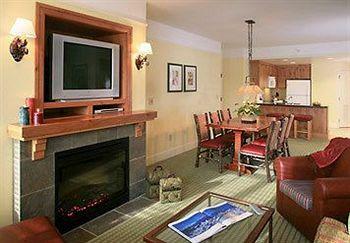 Make a date with your favorite book, and meet at the room's over-sized plush chair and ottoman. Read to your heart's delight in front of the crackling fireplace. Cool feature of the room? There's a washer and dryer that allow you to keep your clothing fragrant and clean. Make it a party in the 1,185 square foot villa. Your family and friends can cozy up together in this option with a maximum occupancy of eight people. There are two bedrooms with a king-size bed in each one, and two sofa beds in the villa. 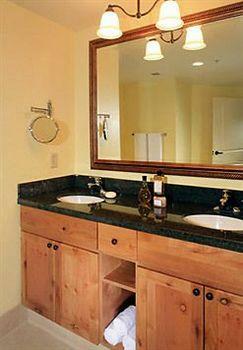 Get clean in a jiffy thanks to the presence of two bathrooms. One has a nifty shower/tub combination, and the other has a super spacious bathtub with spray jets. 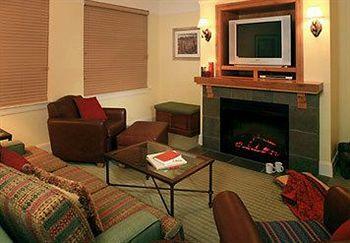 Read books that captivate you by the fireside. When your clothes has gotten all sweaty from your skiing adventures, toss them into the washer and dryer in your villa. Did we mention there's a full kitchen and three 32" TVs here for you? Live large in this villa that's a whopping 1,635 square feet in size. Settle in with a maximum of ten people here. Recharge on the king-size bed in one of the villa's three bedrooms. There are also two sofa beds in the place. When things heat up, you can blast invigorating breezes through the villa with the air conditioning controls. You'll be able to protect the treasures you've brought with you on your trip by using the in-room safe. Should you find an unsightly wrinkle on your clothing, you can smooth it out with the helpful iron and ironing board. When you get hungry from all the fun you're having, you'll have the tools you need to make great meals in the full kitchen.